You are here: Home / Autoimmunity / What is the Best Dietary Recommendation for Rheumatoid Arthritis? Expert recommendations can sometimes be based on limited review of current scientific literature. 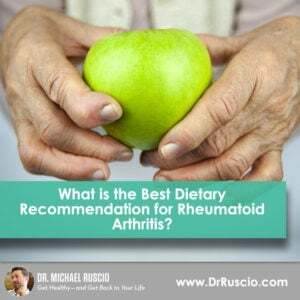 We examine an example in the form of a claim about what diet is best for rheumatoid arthritis and break down how to tell the difference between a scientifically-backed suggestion and expert opinion. If you need help with digestion, click here. To be notified when my print book becomes available & to get a free gut health eBook, click here. If you are a healthcare provider looking to sharpen your clinical skills, click here. Diets and food can have a powerful effect on easing symptoms and repairing the body, especially in the case of autoimmune disease. In some cases, diet is a much more powerful factor in easing symptoms than the pharmaceutical solution for that condition. However, there’s much discrepancy in dietary recommendations. Often people are confused when different credentialed experts recommend conflicting dietary advice for particular conditions. This is because some experts base recommendations on a review of limited data, citing one or two studies, instead of conducting a comprehensive review of the literature. An example is the statement that a vegetarian or Mediterranean diet is the best one for easing symptoms of rheumatoid arthritis (RA). Rheumatoid arthritis is an autoimmune condition of the joints that causes joint pain and deterioration. A Mediterranean diet is one that emphasizes vegetables, whole grains, fish, olive oil, nuts, diary, and beans. A vegetarian diet emphasizes vegetables, grains, and beans and is high in fermentable carbohydrates. Shifting a dietary strategy based on an expert recommendation is a big deal. First, it’s important to understand the difference between evidence-based statements and evidence-limited statements. Evidence limited statements occur when experts make recommendations based on limited information, studies, and research. If one or two studies on vegetarian or Mediterranean diets show symptom improvement in RA, it doesn’t mean there’s conclusive data that they are the best diets for RA. A comprehensive review of the literature is needed to determine how many different dietary studies were done on this topic. The scientific literature that’s currently available shows limited studies on the topic. The majority of studies on RA and diet only looked at the effect of the vegetarian, Mediterranean, elimination, and elemental diets. Of the eight trails, four focused on vegetarian and Mediterranean diets, with only two looking at elemental diets (predigested liquid diets) and two studying elimination diets. There are no current studies on the effect of a low FODMAP diet or low carb/Paleo diet on RA. The small number of studies may give a skewed perspective, and this could lead to bias in the research. The lack of studies from opposing camps (low carb, Paleo, or low FODMAP) creates a research vacuum of important information. At best, this dietary recommendation is evidence limited. And an evidence- based recommendation would draw its conclusion from a wide variety of studies and data before making a recommendation about which is best. Aside from studies, there’s also clinical and anecdotal data to contradict the recommendation that vegetarian and Mediterranean diets are best for RA. Inflammatory bowel disease (IBD) and RA share many therapeutic similarities, and low carb and Paleo diets have shown much promise in helping IBD. Also, another dietary study shows that low carb diets improve symptoms of thyroid autoimmunity, as well as cardio and metabolic function. More dietary studies show that a low sulfur diet (eating vegetables low in sulfur) can be helpful with RA symptoms. Anecdotally, many people with autoimmune conditions feel better on a diet that is free of gluten and nightshade vegetables (tomatoes, pepper, potatoes, and eggplant), all of which are included and emphasized in the Mediterranean diet. Lastly, clinic experience shows that treating SIBO (small intestinal bacterial overgrowth) can be helpful in addressing symptoms of RA. SIBO is treated with herbs and a low FODMAP diet that emphasizes vegetables low in fermentable carbohydrates. Many vegetarian diets, on the other hand can be quite high in fermentable carbs. The eventual goal of any dietary intervention is to heal the gut so that many more foods can be introduced and tolerated. The best diet is one that includes the broadest variety of foods. Before changing your diet on expert recommendations alone, it’s best to look at other research and opinions on the topic. Most experts are busy and don’t have the time to conduct a full survey of the scientific literature before making recommendations. To be notified when my print book becomes available & get a free gut health eBook, click here. I have SIBO, leaky gut, IBS and low IgM, but also autoimmune issues of Hashimoto’s Sjogren’s, and developing RA. Could Enteragam, which has been prescribed for my GI issues, exacerbate my autoimmune issues because it is serum-derived bovine immunoglobulin? My MDs definitely feel, as you seem to, that my microbiome is causing my autoimmune issues, and I don’t want to treat the GI issues but making the autoimmune even worse. Not that I am aware of but I have not researched this issue. A treatment that improves gut health has potential to help with AI conditions. I wouldn’t overthink this. If your doc is recommending this it might be worth a try.